Just back from taking our students to Istanbul for a week. I’ll post some photos later but first pots and cooking. 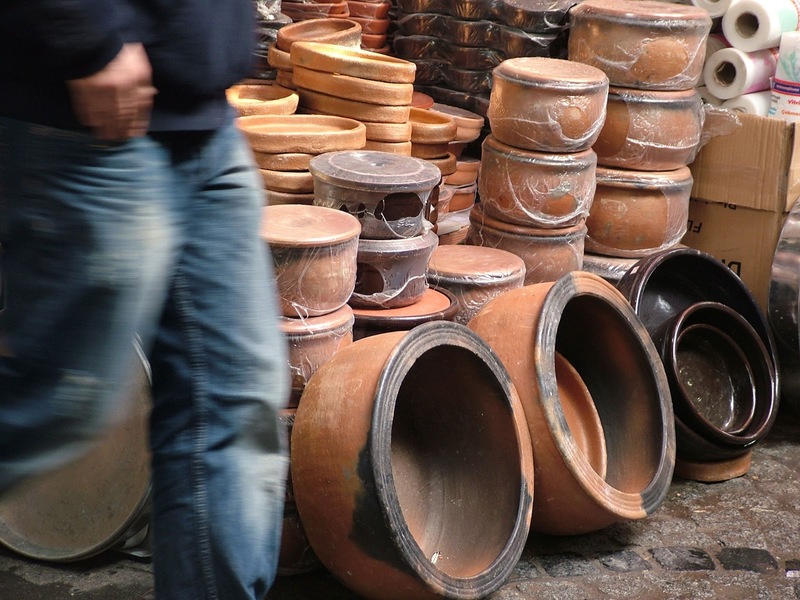 In the Spice Market amongst the kitchenwares are stalls selling a range of what appear to be bonfire-fired pots in a range of sizes from small flat dishes to large globular vessels. Last year I asked the sellers what they were for and with some broken English was told that the small ones were for individual portions of meat stew. A bit of research and some eating this time. The pots are called Güveç and the recipes are named Lamb Güveç etc – something like a lamb hotpot in translation. A good Lamb Güveç (Kuzu Güveç) is a delicious thing. A prawn (Karides) Güveç is good too. There are miriad variations. For a Karides Güveç recipe see the Turkey Expat Forum. Burcu’s blog Almost Turkish Recipes is a good source for Turkish cooking and Binnur’s Turkish Cookbook looks promising too. Güveç for sale in the Spice Market near the Rüstem Paşa Mosque. Single portions of Chicken and Lamb Güveç on the menu of a small restaurant in Sultanahmet. 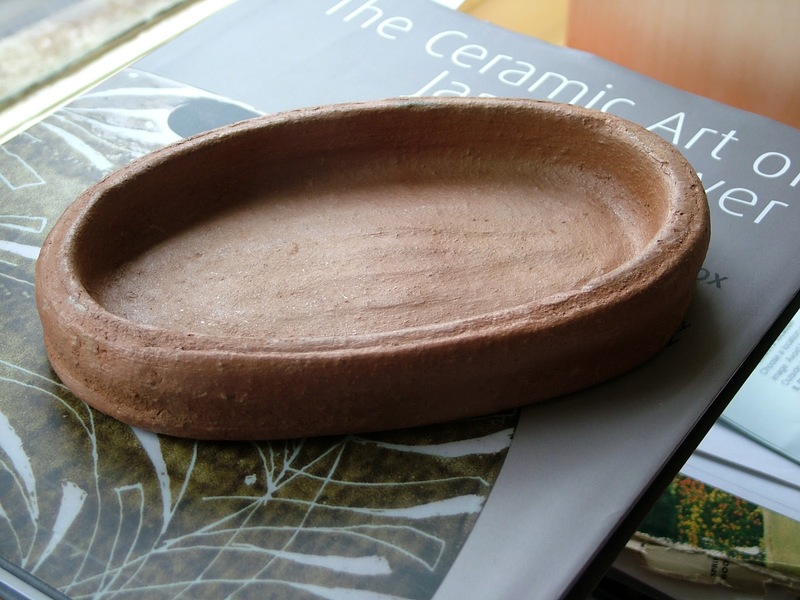 The soft pots soak up oil and juice and develop a patina. Unused the small pots look like this. The body is soft fired and has a very high mica content. It is very like the clays the Spanish use for cooking pots and ovens. The closeup below shows a typical carbon mark most likely from direct contact with fuel. In the market some of them had ash clinging to them too. There are two videos on YouTube showing this kind of pottery being made at Sorkun near Eskisehir in NW Turkey. They have subtitles in English and include interviews with the potters. PArt one is about clay digging and making. Part two includes the unusual open-firing. This entry was posted in Cooking, Turkey. Bookmark the permalink. What an amazing way to fire the pots! Hi Madeleine, It is amazing isn't it. I would be interested to know how common it is in Turkey and whether anyone knows of anything like it elsewhere. Bonfire-firing is an incredibly varied process across the world, adapting to local factors such as climate, tradition and fuels but I don't know of any similar examples. It is almost a 'continuous' process like a tunnel-kiln. Very clever. People have a tendency to call potters like these 'primitive.' Definitely not.